PRE Pole - Portable, Removable, & Extendable IV Pole! A Portable Removable Extendable (PRE) IV pole that can be attached to a stroller, wheelchair, wagon or other item. Perfect for feedings and medication administration on the move. The unit consists of two basic parts: extendable pole (w/hook) and a two piece clamp with hardware. The PRE pole will project straight up from the clamp (vertical to ground) when in use and can be removed and stored away when not in use. The clamp stands less than 4 inches tall. When extendable pole is inserted, overall height is adjustable from 20 to 50 inches. 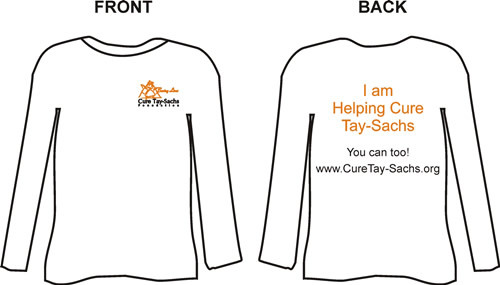 PRE Pole is sold by Nu-Di Corporation for $49.99 with a portion of each sale being donated to the Cure Tay-Sachs Foundation!! 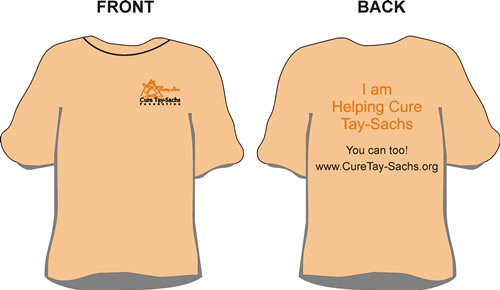 Cure Tay-Sachs T-Shirt - "I am Helping Cure Tay-Sachs"
WE ARE CURRENTLY RE-THINKING OUR PROMOTIONAL ITEMS DISTRIBUTION. Currently SOLD OUT of Everything! Choose Your Size: Youth M (10-12) Youth L (14-16) Adult XXXL 1 in stock!! "Window Clings" apply cleanly and adhere to glass such as home windows, car windshields, rear-windows, etc. Window Clings are SOLD OUT! 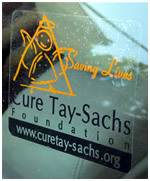 Window clings are 5" wide by 3.5" tall and yours for a donation of $3. "Car Magnets" apply cleanly and magentically adhere to metal doors, panels, car fenders, etc. Car Magnets are currently SOLD OUT!! Car Magnets clings are 5" wide by 3.5" tall and yours for a donation of $3. To get both the car magnet and the window cling, please donate $5. Currently SOLD OUT of Car Magnets and Window Clings!